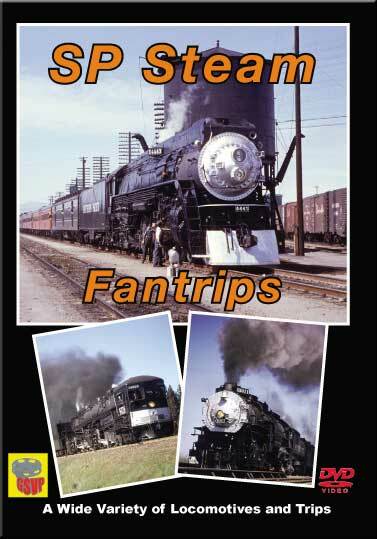 Our look at SP Steam Fantrips starts in 1951 and ends in 1958 with the final SP steam fantrip. We will enjoy Cab Forwards, 4-8-2's, 4-8-4's including 4443 and 4460, 4-6-0's, 2-8-0's, AC9 articulated engine, 4-10-2's and 4-6-2 pacifics including 2475. There is a wide variety of trackage seen which includes seeing some steam in regular service from the excursions. There are several trips where multiple engines were used during the day, or over several days. It is really amazing to see all this different steam power, and the variety of destinations. On one trip from Oakland to Santa Cruz there were 3 engines used each way. Toward the end of steam we see some trips with 4-8-4 4443, 4-6-2 2475, and 1744 and 4460 which was the final engine to operate on SP mainline trackage. This engine is now at the Museum of Transport in St. Louis. We have included all the dates of these trips and as much info on the excursions and engines as possible. This is a really fine show of steam that does the Southern Pacific proud. The collection comes from Ken Shattock and a variety of photographers, including his grandfather Victor Shattock. Maps help guide you along the various routes. We know you will enjoy this one very much with its great variety and solid documentation of the trips that once operated over the former SP rails. Choo Choo John (Colorado) on 2014-07-20 18:17:49. Good subject content. All steam fans will enjoy the show. This producer offers many fine presentations. I enjoy them all. However, I do not care for the choice of music used. It either makes me feel sad or makes me fall asleep. Either way, it distracts from the sound portion of the shows. Would be much better if producer used proper period music such as 1940s Swing or WWII songs, or something peppy and happy. Also, a pet peeve of mine......I do not like being told when a locomotive was scrapped. It's like being told when a dear friend died. I can do without that information!! Nathaniel Huntley Jr (Woodlynne, New Jersey) on 2013-03-16 23:50:04. 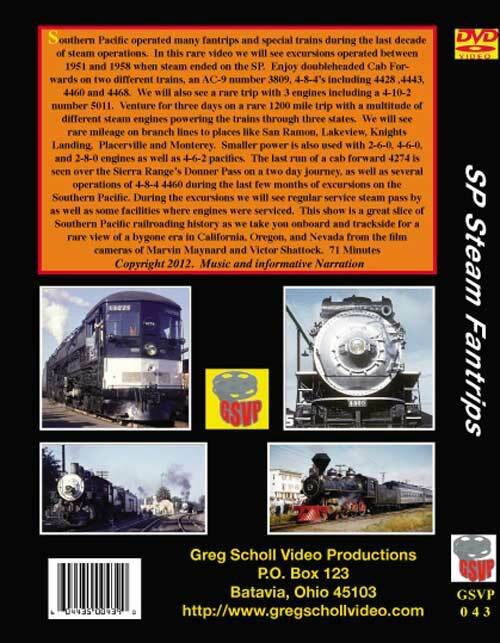 This is a great DVD with a lot of Southern Pacific steam history that should enjoyed by all steam buffs.This DVD will be a great addition to your collection! Steamboy (Revere MA US) on 2017-07-28 09:45:30. This 2012 program features the farewell trips of regular steam on the actual railroad itself incluing some future famous survivors (1744, 2248, & 4460). In the closing credits there is a black and white still image of a boy scout trooper playing taps on the bugle to say goodbye forever to Southern Pacific Steam. As with most of Greg's Vintage programs, Music from Gene Michael Productions is used as well as some decent narration From John Edward Hingsbergen. Who knows what would happen in the future when Greg Makes a Southern Pacific Steam Pack with only the ones from the vintage years?